Neil Cornrich & NC Sports, LLC: How hard will they try to re-sign Rex Burkhead? From Geoff Hobson's article "Finale kicks off offseason"
The Bengals and the Ravens are playing for nothing, so they say, in Sunday's regular-season finale (1 p.m.-Cincinnati's Channel 12) at Paul Brown Stadium. But it is New Year's Day and so it's rather fitting that the first day of 2017 is going to display for one last time all the questions that Bengaldom will immerse itself in for the rest of the year. So, even though Big Whit and T. Sizzle aren't teeing it up for a play-off spot, the swirling questions in the wake of their first losing season in six years are still going to make for an eventful week around PBS. 5. HOW HARD WILL THEY TRY TO RE-SIGN REX BURKHEAD? All indications are very. The kid has been terrific playing in place of injured running back Giovani Bernard in the last five games. Now you get an idea what it is like to watch the Patriots every week. It seems like they've got 50 guys that play reliably, well, and no nonsense like Burkhead. He's got 186 yards on 41 carries in the last five games for 4.5 yards per carry and maybe the biggest deals are he's been yet to be stopped on third-and-one and has been absolutely clutch in the one- and two-minute drills. In that same stretch Jeremy Hill has run it at 2.5 yards per 87 carries. Yes, Hill is banged up but at the same time the numbers are eye-popping. 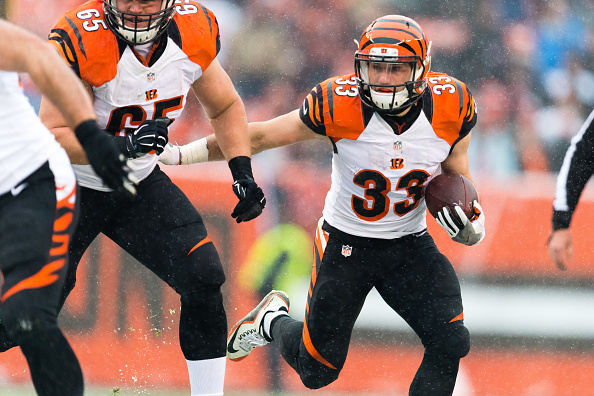 Look for a massive effort to re-sign Burkhead. They'll figure out how to get him on the field later, but you can be sure it won't take four years this time. And that's just a start. We haven't even got to cornerback Darqueze Dennard , another first-round pick heading into his option year that hasn't played much but may have to if Dre Kirkpatrick leaves in free agency. Or the kicking situation with no heir apparent to Mike Nugent apparent. Or …. But it's only the first week.